Andy Greene of Rolling Stone magazine recently conducted an interview with Geddy Lee where the two discussed the progress on Rush's forthcoming studio album Clockwork Angels as well as the Time Machine Tour DVD, touring and more. What's the status of the next album? We're almost finished writing. We wound the machine back up about three weeks ago. After a sluggish start, we've had a very fruitful couple of weeks in terms of writing. I'm very pleased with the direction that the material has taken. And I think we have one or two more songs that we'd like to write, and then we'll start recording in earnest. Hopefully we'll have all of the recording done before Christmas. Then we'll mix it some time in the next year, and then get it out. Wow. So it'll be out sometime early next year? Yeah. I hope it'll be out by the spring anyway. Is the sound of the album similar to Snakes and Arrows? From the article: "...we decided it was the perfect time to speak with guitarist Alex Lifeson about Rush's first recorded work...some 38 years ago. Sean Murphy of PopMatters has posted a fantastic, in-depth review of Rush's seminal classic Moving Pictures: Every band, if they are lucky, is able to create a definitive work—a document that embodies their unique qualities. Most great bands, at some point in their career, successfully produce an enduring statement. Some artists, like The Beatles or Pink Floyd, are able to capture—or create—the Zeitgeist on more than one occasion On the other hand; there are plenty of worthwhile and beloved bands who have never quite been capable of distilling the necessary ingredients of a classic recording. Finally, there are those almost unfathomable works that only a handful of bands can claim credit for. These exceptional albums are wholly original yet fully accessible and remain influential and imitated long after their release. Modern Drummer has also reviewed Neil's instructional video Taking Center Stage where they wrote "...If you’re a Peart devotee, you’ll drool over the detailed shots of the concert performance revealing all of the intricate details of those classic parts. The overhead shots and slow-motion footage are particularly revealing of Neil’s complex choreography..." You can read the entire interview via this LINK. Regarding Clockwork Angels, Rich had this to say: ... Currently, Rush, producer Nick Raskulinecz and myself are reconvening to complete the recording of Rush's next studio album Clockwork Angels. Sorry, no timeline for completion yet ... Good news there that progress on the album is continuing. We're saddened to announce the passing of Freddie Gruber; the drumming legend that inspired many drummers through the years including, of course, Neil Peart. Freddie died on October 11th at the age of 84. As well as being a respected jazz drummer, Freddie enjoyed a long and successful career as a drum teacher. In adddition to Neil Peart, he counted drum heavyweights such as Dave Weckl, Steve Smith and Vinnie Colaiuta as among his students. Last year Freddie's was honoured by Zildjian for his lifetime of achievement in the drumming world. Read more about Freddie's history via this LINK. Our condolences go out to Freddie's friends and family. Below is a segment from Rush's Beyond the Lighted Stage documentary that featured Neil Peart and Freddie Gruber. The man will be missed. The reissuing of Rush's back catalog of music during their Universal/Mercury Records days is nothing new. However Rush will now receive an interesting "Box Set" treatment. According to the Universal Music Group, three distinct Rush "Sector" Box sets will be released this November 21st. Within each "Sector" box set, one album will receive a 5.1 surround sound treatment. Order now, in time for the Pagan Midwinter Festival! The calendar is now available for pre-order and is set to be released October 17th. Update: October 20th, 2011 The auction is now underway. Click HERE to access the auction for Alex's painting. Good luck, all. As he has done numerous times in the past, Alex Lifeson has donated one of his personal paintings to the Kidney Foundation of Canada's A Brush of Hope project. 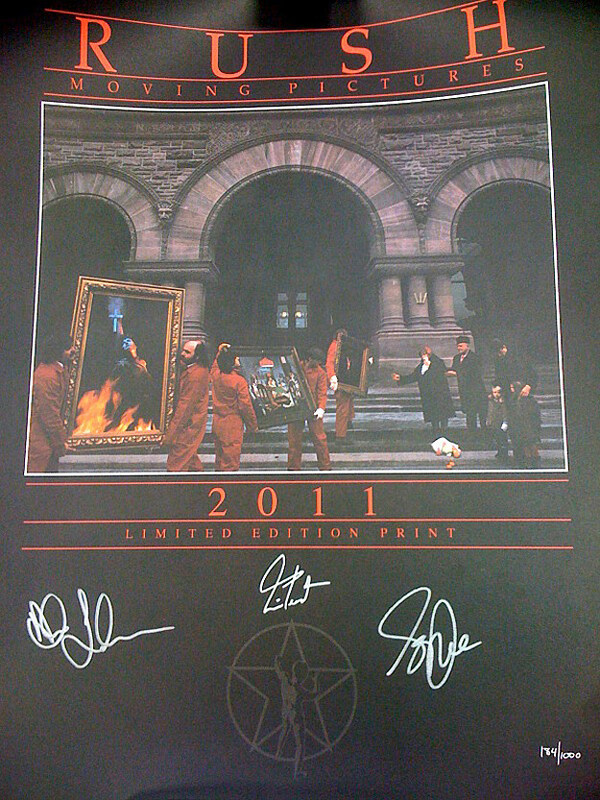 Lifeson's painting, along with artwork from many other Canadian artists will be auctioned off to raise money for the charity.